Not surprisingly, it did not take readers long to reach a consensus about the identity of yesterday's ID challenge: the lower jaw of Kogia breviceps, the pygmy sperm whale. 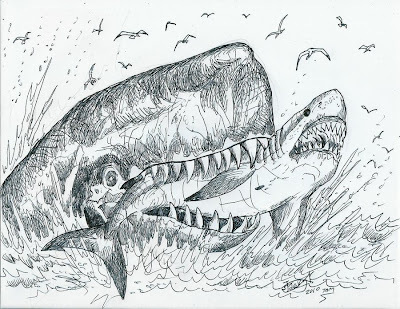 Kogia is distinguished from other toothed whales by its relatively small number of noticeably slender teeth; K. breviceps is usually distinguishable from the other species in the genus, the dwarf sperm whale K. sima, by having 12-16 pairs of teeth in the lower jaw (K. sima usually has 8-11). 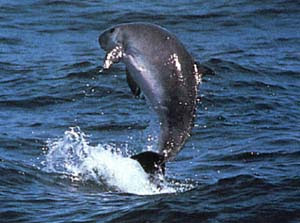 Dwarf sperm whale, Kogia sima. The two Kogia species are externally very similar; indeed, Watson (1981) noted that their status as separate species had not yet gained universal acceptance. Photo by Robert Pitman. The family Physeteridae as used in this post includes just three living species, the great sperm whale Physeter macrocephalus* and the two Kogia species (alternatively, many authors refer to this groups as the superfamily Physeteroidea, separating the living genera and their respective stem groups between families Physeteridae and Kogiidae). Though superficially distinct in appearance, the two genera share a number of unusual characteristics including enamel-less teeth (that are restricted to the lower jaw) and an externally squared head with anteriorly placed blowhole. The distinctive profile is due to the spermaceti organ, a pair of gigantic oil-filled sacs that fill the inside of the head. The upper sac, the spermaceti, contains a less dense oil than the lower sac, the junk. Just exactly what the spermaceti organ does is still uncertain; proposed uses (which are not all mutually exclusive) include vocalisation, echolocation, use as a battering ram (Carrier et al., 2002) and for buoyancy control (with the whale controlling the temperature of the organ by controlling the bloodflow to it and hence controlling the specific gravity of the contained oil) (Clarke, 1978). All living species feed primarily on squid though the Kogia species eat more fish than does P. macrocephalus**. *The scientific name of the sperm whale is renowned for being one of the most prolonged, contentious and utterly pointless conflicts in zoological nomenclature. The needless complexity of this argument is such that I'm going to farm it out to a separate post rather than try to stuff it into this one. **I've come across a number of references to the sperm whale as the largest ever carnivore. This isn't actually true. Even if one excludes the blue whale Balaenoptera musculus as a 'carnivore' due to its diet of planktic crustaceans (still technically animals), P. macrocephalus is just edged out of the top spot by the fin whale Balaenoptera physalus which, in at least some parts of its range, feeds primarily on fish (Watson, 1981). 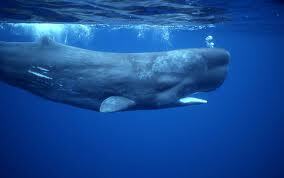 The great sperm whale, Physeter macrocephalus. Source of image uncertain: I got it via Google Images from here, but the actual link appears to be broken. However, as is not uncommon in the world of biology, the most familiar members of this family are far from being the most typical. The fossil record of Physeteridae sensu lato extends back to the Oligocene; for most of that time, fossil sperm whales had teeth far more intimidating than those possessed by any living species, indicating diets potentially more rapacious* (take a look at the gnashers in the specimen pictured at the top of a Tet Zoo post on the subject). Just this year, of course, we saw the publication of 'Livyatan', the largest of these killer sperm whales, with a skull some 3 m in length (Lambert et al., 2010; unfortunately, the original name bestowed on this animal, Leviathan, has turned out to be preoccupied, admittedly under pretty goofy circumstances). Bianucci & Landini (2006) suggested that the raptorial sperm whales may have been edged out by the evolution of large predatory delphinids (the lineage including the modern killer whale Orcinus orca) during the Pliocene, leaving only the squid-eaters behind. *Interestingly, while both genera of living sperm whales lack teeth in their upper jaws, the loss of upper teeth seems to have happened independently; the stem lineages for both genera include taxa with teeth in both upper and lower jaws (Lambert et al., 2010). Rather than the usual reconstruction of 'Leviathan' melvillei, I thought I'd show you this one by Hodari Nundu. The shark is supposed to be a juvenile. Bianucci, G., & W. Landini. 2006. Killer sperm whale: a new basal physeteroid (Mammalia, Cetacea) from the Late Miocene of Italy. Zoological Journal of the Linnean Society 148 (1): 103-131. Carrier, D. R., S. M. Deban & J. Otterstrom. 2002. The face that sank the Essex: potential function of the spermaceti organ in aggression. Journal of Experimental Biology 205: 1755-1763. Clarke, M. R. 1978. Buoyancy control as a function of the spermaceti organ in the sperm whale. Journal of the Marine Biological Association of the United Kingdom 58: 27-71. Lambert, O., G. Bianucci, K. Post, C. de Muizon, R. Salas-Gismondi, M. Urbina & J. Reumer. 2010. The giant bite of a new raptorial sperm whale from the Miocene epoch of Peru. Nature 466: 105-108. Watson, L. 1981. Sea Guide to Whales of the World. Hutchinson. "The scientific name of the sperm whale is renowned for being one of the most prolonged, contentious and utterly pointless conflicts in zoological nomenclature. The needless complexity of this argument is such that I'm going to farm it out to a separate post rather than try to stuff it into this one." Great! I don't quite know why, but I usually find it highly entertaining to read about nomenclatural melodrama. Regarding predatory habits of modern sperm whales; while it's undoubtedly a squid specialist, Physeter macrocephalus does also feed on rather sizeable deep-sea sharks on occasion. I recall reading (in the grey literature) that even seals have supposedly been found in sperm whale stomachs. wow! have learned something this week, thank you for this great post!